Mountain goats were introduced to the Olympic Peninsula in the 1920s. Seven years ago, a large male mountain goat charged and fatally gored a hiker from Port Angeles, Washington. Rangers already have the authority now to shoot mountain goats that display threatening behavior, but the National Park Service wants a more comprehensive solution. The new draft environmental review details management options. Olympic National Park Lead Wildlife Biologist Patty Happe said the preferred alternative entails capturing mountain goats in the Olympics and relocating them to national forest lands in the North Cascades. "We have this kind of unique opportunity to take a species from an area where we feel it doesn't belong to an area where they are native and where the populations aren't doing so well,” Happe said. The Park Service also wants the backup option of killing goats that escape capture. Happe said the objective is to take the population of mountain goats in the Olympics "down to zero ultimately." "We're going to move as many as we safely can and then when that operation is no longer feasible, then lethally remove the rest," she said. According to a 2016 survey, more than 600 exotic mountain goats graze in the fragile alpine meadows of the Olympic Mountains. Happe said the development of this mountain goat management plan has been a years-long process that began in more limited form around 2007. The next step is to receive public comment and analyze it before releasing a final management plan. The plan will cover the national park and adjacent areas of Olympic National Forest. The U.S. Forest Service, the state Fish and Wildlife Department and area tribes collaborated on the draft environmental impact statement. Public comments will be accepted through September 26. A series of public meetings in mid-August in Olympia, Port Angeles, Everett and Seattle will provide opportunities to learn more and ask questions. Provided no deal breakers arise, Happe said the earliest rangers and biologists could begin carrying out the plan is next summer. She said the process is moving into higher gear in part due to the concerning results of recent goat population surveys. "The goat population is now growing at a rate of about 8 percent per year," Happe said in an interview Monday. "Each year we delay, it just makes it that much harder and that much more expensive to implement. So there is incentive to kind of get going." 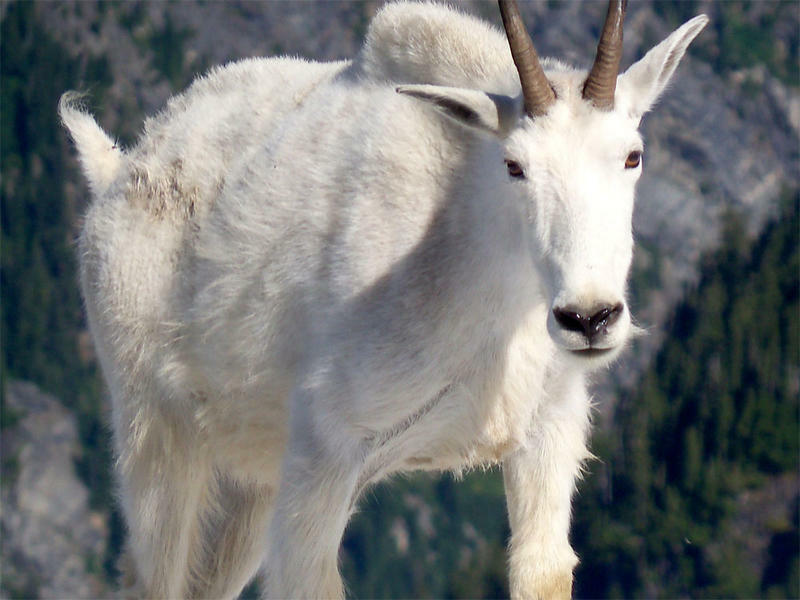 Today's Olympic goat population is descended from a dozen mountain goats from Alaska, which were introduced to the Olympic Mountains by a sportsmen's group in the 1920s. This preceded the creation of the national park in 1938. The photogenic but pesky animals have multiplied ever since. During the 1980s, the Park Service carried out a series of live-capture operations and relocated 407 mountain goats throughout several western states. "Live-capture operations were halted in 1990 for several reasons, including employee safety, animal safety, and changing Department of the Interior rules concerning helicopter landing techniques," the draft EIS reported. Tim McNulty with the conservation group Olympic Park Associates told the Associated Press that he favors the goats' removal. He said there's overwhelming evidence that the goats are harming the natural landscape and plant habitat. "They're clearly non-native, and restoring the integrity of the alpine areas and protecting other animals is much more important than maintaining a non-native goat population," he said.